For other uses, see Malavika (disambiguation). Unnai Thedi is a 1999 Tamil film directed by Sundar C. The film features Ajith Kumar and Malavika in the lead roles, while an ensemble supporting cast includes Karan, Vivek, Sivakumar, and Srividya. It is an unofficial remake of Sharukh Khan's 1995 Blockbuster movie DDLJ. The film's music is composed by Deva, and the film released in February 1999 to average reviews and but it was declared superhit at the box office. Shweta Menon is an Indian model, actress and television anchor. She won Femina Miss India Asia Pacific 1994. She has predominantly acted in Malayalam and Hindi language films, besides appearing in a number of Tamil productions. Hindu Mahila Vidyalaya was a boarding school located at 22 Beniapukur Lane, Entally, Kolkata, India and founded by Annette Akroyd The school made a break with the idea of a less taxing curriculum for girls and provided the same kind of learning for its students as was available for boys. Sources record different dates for the establishment of the school. While Jogesh C. Bagal records the date of establishment as 18 November 1873, David Kopf mentions it as 18 September 1873. Shweta Tiwari is an Indian film and television actress. She has appeared in Kasautii Zindagii Kay as the lead protagonist. In 2010, she won the reality show, Bigg Boss 4 with ₹ 10 million as prize money and appeared on Jhalak Dikhhla Jaa Season 6 as a participant in 2013. She has also worked on other TV shows including Parvarish and Begusarai. The Filmfare Best Actress Award is given by the Filmfare magazine as part of its annual Filmfare Awards South for Malayalam films. The awards were extended to "Best Actress" in 1972. The year indicates the year of release of the film. Shweta Basu Prasad is an Indian film actress. She started her career as a child actress in Hindi films and television series and went on to play lead roles in Bengali, Telugu and Tamil cinema. For her performance in the 2002 film Makdee, she won the National Film Award for Best Child Artist. Shweta Tripathi is an Indian actress. She is best known for playing the role of Dr.Shreya Pathare in Amazon Prime Originals Laakhon Mein Ek Season 2. Zenia Khan in the Disney Channel Original Series Kya Mast Hai Life. She also appears in ads for Tata Sky download and McDonald's and most recently Tata Tea. She is known for her roles in films like Masaan and Haraamkhor. Malavika Avinash is an Indian actress, television personality and politician. She is known for her work in Kannada and Tamil films. She hosted Baduku Jataka Bandi, a television show that aired on Zee Kannada. Malavika Mohanan is an Indian film actress, who has predominantly worked in the Malayalam film industry. She has also appeared in a number of Hindi, Kannada and Tamil films. Kshanam is a 2016 Indian Telugu mystery thriller film released worldwide on 26 February 2016. It was directed by Ravikanth Perepu, with Adivi Sesh and Adah Sharma in lead roles and Anasuya Bharadwaj, Vennela Kishore, Satyam Rajesh, Satyadev Kancharana, and Ravi Varma appearing in supporting roles. Music is by Sricharan Pakala and cinematography by Shaneil Deo. The film opened to critical acclaim & commercial success. The film was remade in Tamil as Sathya (2017) and in Hindi as Baaghi 2. 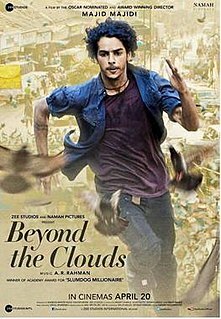 Beyond the Clouds is a 2017 Indian drama film written and directed by Majid Majidi, under the production banner Zee Studios. It stars debutante Ishaan Khatter as Amir, a street hustler and drug dealer in the city of Mumbai. Malavika Mohanan as Tara, is the sister of Amir. She works for a dour merchant Akshi. The film story is centred around bonding between the siblings, a take on human relationships in general. The sibling's bond is put to test when Tara lands in jail for a crime committed by Amir which forms the crux of the film. The film is a grown-up version of Majidi's previously directed Children of Heaven (1997). The original language of Beyond the Clouds is Hindi. Sathya is a 2017 Indian Tamil-language mystery action thriller film directed by Pradeep Krishnamoorthy, who had previously directed the film Saithan (2016) starring Vijay Antony. An official remake of the Telugu film Kshanam (2016), the film features Sibi Sathyaraj, Remya Nambeesan and Varalaxmi Sarathkumar in the lead roles. The film, produced by Maheshwari Sathyaraj under the banner Nathambal Film Factory, has music composed by Simon K. King and was released worldwide on 8 December 2017. Super Singer 6 was a 2018-2018 Indian Tamil language Reality singing competition show, the sixth season of the Airtel Super Singer show, which aired on Star Vijay on every Saturday and Sunday at 19:00 (IST) starting from 21 January 2018 until 15 July 2018. The show was hosted by Ma Ka Pa and Priyanka. The Judges of the show were the popular playback singers P. Unnikrishnan, Anuradha Sriram, Shweta Mohan and Benny Dayal. The Grand finale was held on 15th July 2018 and was a live telecast through Star Vijay. Shrikanth, Shakthi, Anirudh, Malavika, Rakshitha and Senthil Ganesh were the final 6 contestants. Folk singer Senthil Ganesh emerged as the title winner of the show who also got a chance to sing in A.R.Rahman's music and as a first Runner up The versatile singer Golden voice of super singer 6 Rakshitha and Shrikanth impressed A.R.Rahman sir by his performance. Rakshita and Malavika emerged as 1st and 2nd runners up respectively. ↑ "Celebrity Speak". Rediff. Retrieved 22 May 2016. ↑ "Shweta Konnur Menon". Twitter. Retrieved 22 May 2016. ↑ Gahlaut, Kanika (26 May 2003). "Shock and sensuality". India Today. Retrieved 22 May 2016. ↑ "Shweta Konnur". British Film Institute . Retrieved 22 May 2016. ↑ Padukone, Chaitanya (11 February 2007). "March wedding for Shweta Konnur". DNA. Retrieved 22 May 2016. ↑ "Malavika weds Sumesh". Sify. 8 March 2007. Retrieved 22 May 2016. ↑ "Malavika plays lead role in Hindi film `See you at 9'". The Hindu. 23 June 2005.